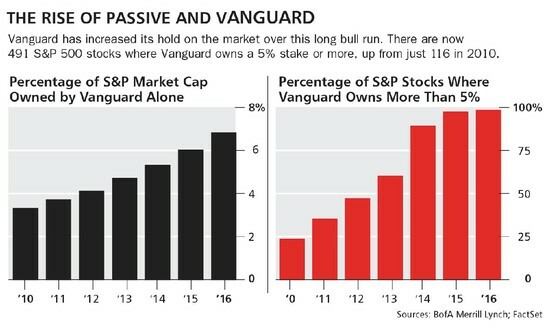 1.Vanguard Owns 5% of 491 out 500 S&P Stocks. Read Full Barrons Story on the Rise of Indexing. 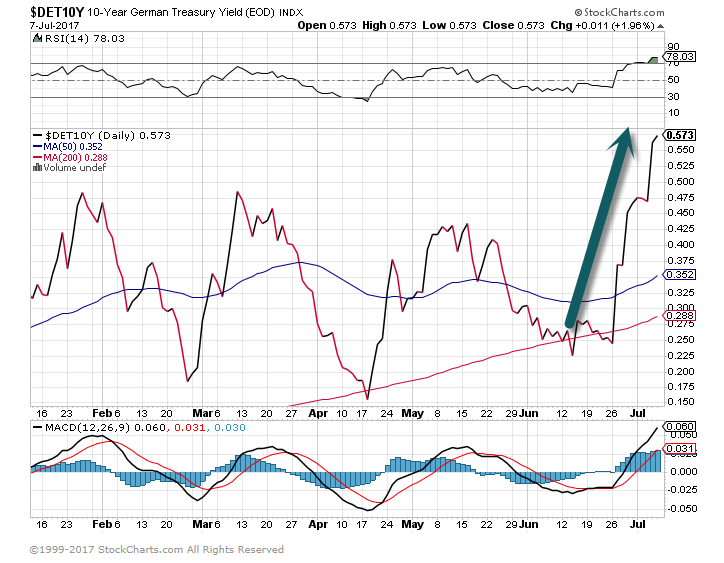 2.All the Market Talk this Week=The End of Global QE…..German 10yr. Treasury Yields Double. 3.Rates and utility stocks…Watching Rate Sensitive Sectors. Utilities Pullback into 2017 channel…Watching for more serious breakdown. 4.U.S. Dollar Drifting to 2016 Lows. 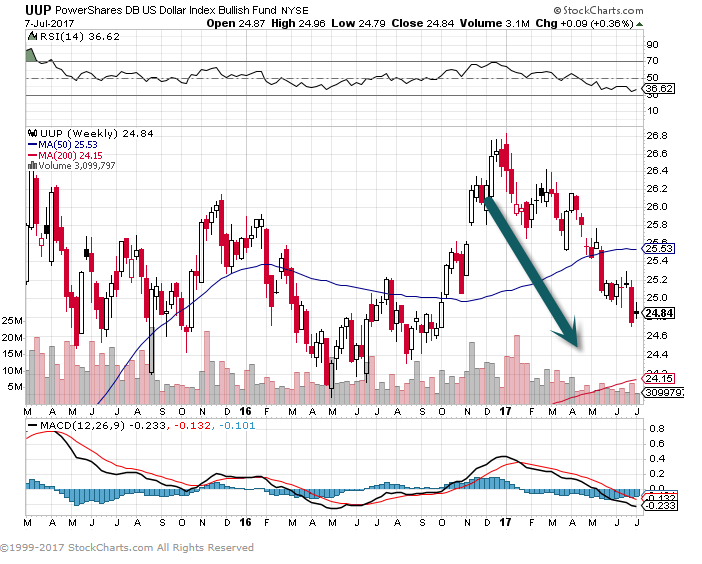 Dollar the Biggest Factor in Rate Watch ….Huge global and sector implications. 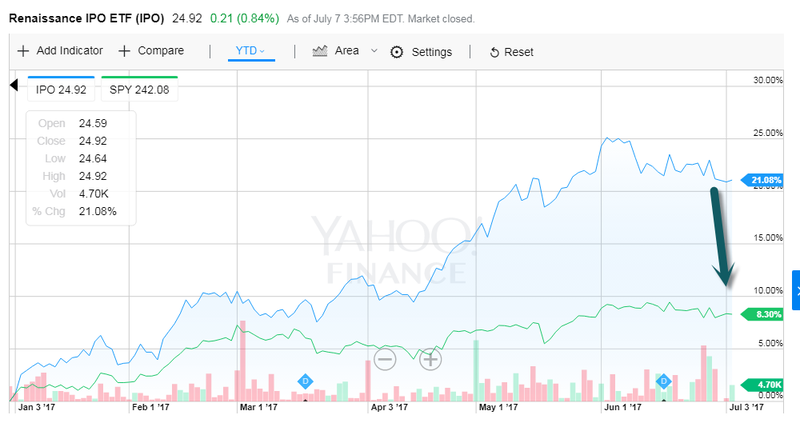 5.IPO Market Performance Crushing the S&P this Year…Remember Over 100 PE Backed Companies with $1B Private Valuations. 6.Another Example of ETF Effect on Investing World….Low Vol ETFs have Grown 150% Annually Since 2009. Yikes! Pre 2009 99.9% of America Thought Low Vol Meant Turn Down Radio. Coming out of the financial crisis, it was easy to see the appeal. 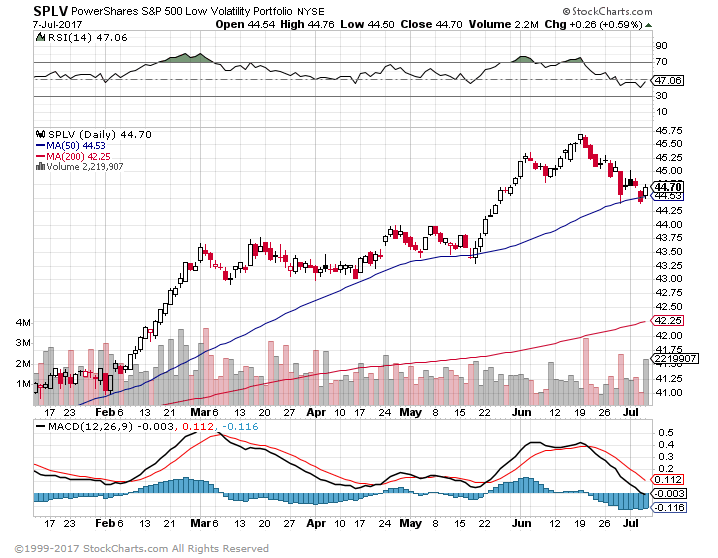 But somewhere along the way, investors started to confuse low volatility with low risk. Assets in low-volatility exchange-traded funds have grown at a 150% clip annually since 2009, according to Bank of America Merrill Lynch data. BofA says the ratio of their valuation relative to the market’s most volatile stocks has moved up to 1.18, up from 0.48 in June 2009. 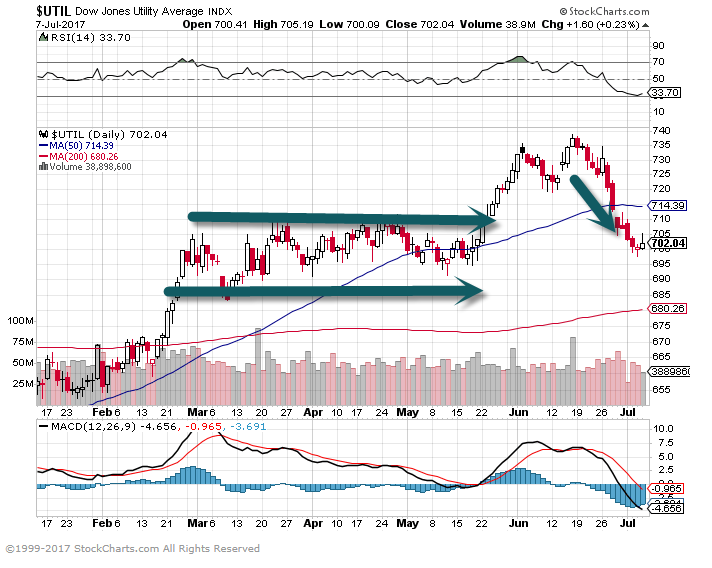 The takeaway: Just because they’re low vol doesn’t mean the stocks aren’t expensive. 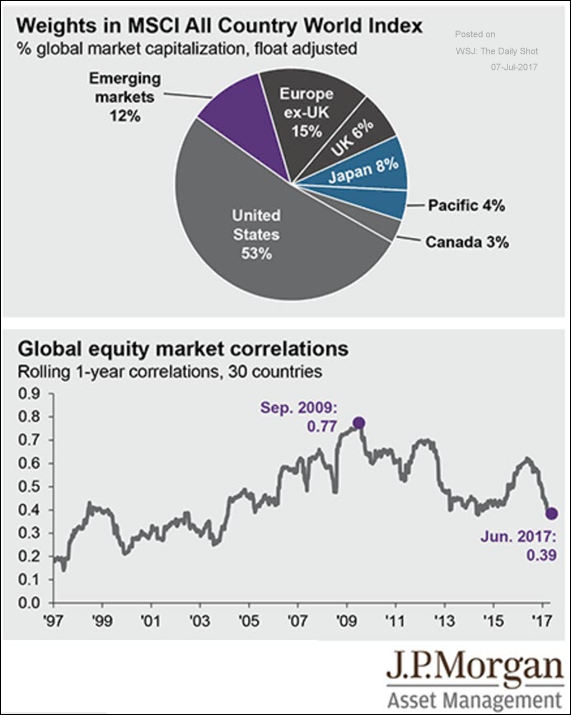 Equity Markets: Correlations across global markets remain relatively low. 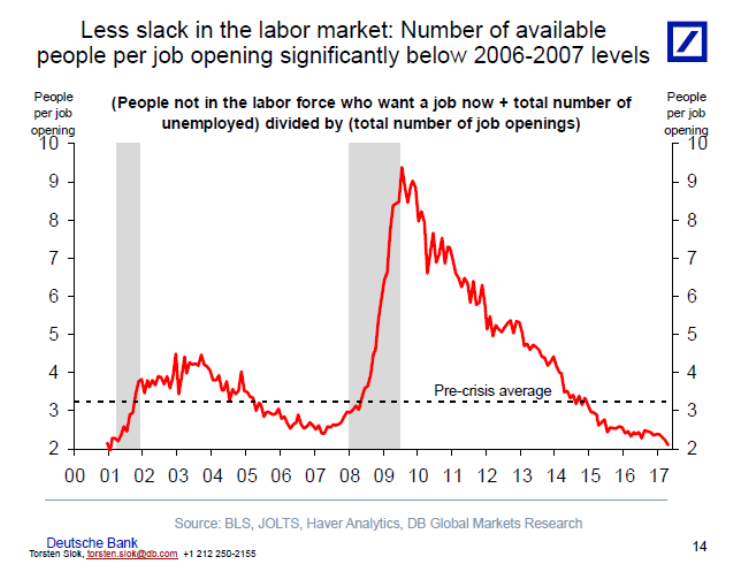 8.So Much for the End of U.S. in 2008…From Buy Gold to No Available Workers. Number of Available Workers Significantly Below 2007 Levels. A Goldman Sachs economist discussed the economic impact of the opioid crisis in a rare report for a Wall Street investment bank. · One consequence of drug abuse may be felt in the labor force participation rate, which measures the number of people employed or actively looking for employment. 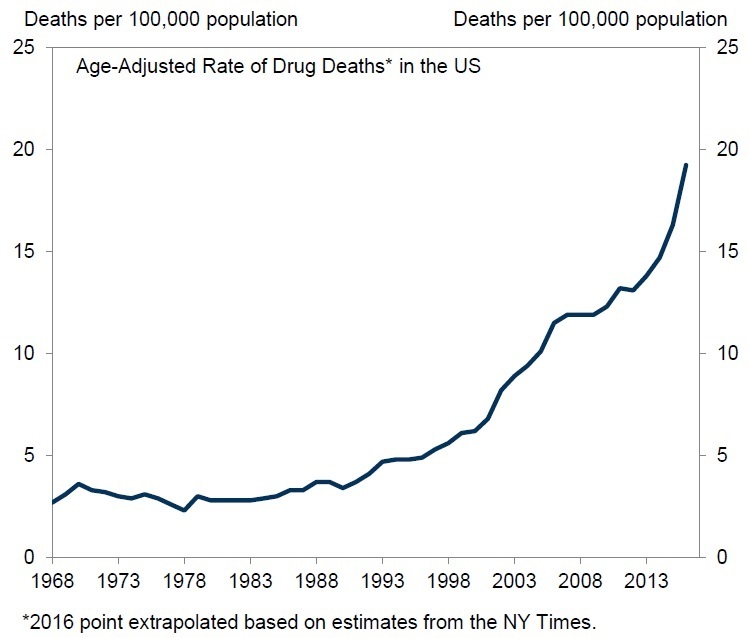 · The growing opioid epidemic kills more than 90 Americans every day. The opioid crisis has major costs for the U.S. economy, including the labor market, David Mericle, senior U.S. economist at Goldman Sachs, said in a Wednesday note. The report is one of the first from a major Wall Street bank focused on the growing epidemic killing more than 90 Americans every day. “The opioid epidemic is intertwined with the story of declining prime-age participation, especially for men, and this reinforces our doubts about a rebound in the participation rate,” Mericle said. The labor force participation rate, the number of people working or actively looking for work, has fallen since the Great Recession and has stagnated near 63 percent for the last four years, according to the U.S. Bureau of Labor Statistics. This stagnation comes despite monthly jobs reports, such as the one due Friday, showing a steady pace of job creation and a decline in unemployment. It’s a been a puzzle for economists: Why aren’t more people actively looking for work again with the job market so strong? Part of the answer may be opioid addiction, the Goldman report suggests. If the opioid epidemic prevents the participation rate from increasing, the Federal Reserve may not be able to fulfill the full employment part of its dual mandate for achieving a strong economy. “The economic consequences of the opioid epidemic extend beyond the labor market,” Mericle said. 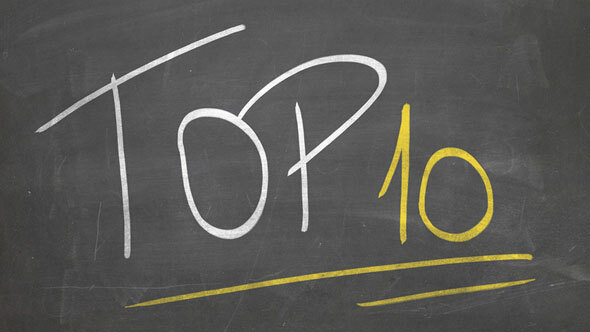 10.Do People Learn More from Mistakes or Successes? These statements are only partially true. Feedback often doesn’t work. It’s dangerous to believe giving feedback and advice is your best way to help people grow. Feedback can be useful when people want to achieve a goal but their behavior is hindering their progress. However, unless people ask for your guidance or expect you to show the way, the “helpful” information you give them to correct their faults often raises defenses or lowers confidence. They either resent you or are reluctant to take risks, decreasing their capacity to master their goal. Most people want to get better. They want to discuss challenges and different ways to approach future situations. They don’t want one-way directives focused on what they did wrong. Feedback doesn’t work if the person can’t absorb what you are saying. Most people are not raised or trained to comfortably accept criticism. When people are given negative feedback, they move into a mental and often physical defensive posture. This closes instead of opens the mind to seeing situations differently. They may accept what you offer, but their brain can’t fully absorb and use your information in the most effective way. People want to learn and grow but they also have a basic human need for acceptance. Unsolicited, one-way feedback hurts. Solicited feedback can also hurt if you don’t engage the person to understand their perspective, their choices, and acknowledge their good intentions. Professor Adam Kepecs of the Cold Spring Harbor Laboratory says sensory information impacts how we learn.2 When we recall victories from winning strategies, positive behavior is reinforced. The dopamine release builds confidence and increases the chances the person will make quick, clear decisions when faced with similar situations. In other words, people learn more efficiently from their successes than their failures. The dopamine release with positive reinforcement increases the chance of “learning” to occur and behavioral change to stick. The more often you win, the greater your confidence and desire to risk. The brain needs evidence of success to support ongoing effort. The brain’s primary purpose is to protect you from harm, including feeling shame. If people only hear negative feedback, they will hesitate in the future. They might even give up all together. If someone has a goal they want to accomplish but their actions led to harmful or less than desirable results, talking to them about the impact of their decisions is helpful. The focus needs to stay on the goal, and needs to be balanced with other conversations only focused on what the person is doing well. And don’t let the word “failure” come into the conversation. The brain can handle mistakes much better than failures. This post does not suggest you coddle people. If a course correction is needed but the person will shut down to either direct or “sandwiched” feedback (placing negative feedback between two compliments), what should you do instead? Here are 7 steps to consider. 1. Regularly check in. With regular conversations, you have a greater chance of acknowledging wins and good effort when you can. 2. Create a safe space. Before entering the room, remind yourself of their desires and hopes for the future. If you are irritated, shift to feeling optimistic and curious. Remind yourself that they are doing their best with what they know. They need to feel seen, heard, and respected to risk thinking out loud with you. 3. Start with coaching. Start by asking for their perspective of the challenges they are facing. Listen and summarize their assessment. Share what you have experienced as the impact of their behavior and how this is affecting the successful achievement of their goals. Ask how you can support their learning and development. Ask them to make suggestions for improvement before you offer your own. 4. Don’t focus on what went wrong. Discover their desired goals and keep the focus on what it will take to better achieve these outcomes. Be careful you aren’t just telling people what you would do differently if they are doing fine on their own. 5. Give clear expectations of results. As they work toward their outcomes, be clear on what you and others expect will happen. Set regular conversations and be accessible as they work on making changes. Then remember to acknowledge their efforts as well as results. 6. Be comfortable with negative reactions. If you stay present, grounded, and caring they will process through their emotions. Give them a chance to learn and grow before you stop or save them. 7. Be patient. Self-reflection and grasping a new way of thinking takes time. To ensure you will make the changes you need to have better growth conversations, track and review your progress daily. Once a day, note every time you remembered to reinforce effort and acknowledge wins when talking to others. See how quickly you change with positive reinforcement instead of beating yourself up for what you forget to do.